This kanban self-assessment consists of 20 questions of various types about the concepts of kanban for knowledge work. To gain access to the self-assessment, send us a request by clicking here. It is important to underline that kanban is not a prescriptive method. Each organization using kanban must find the most appropriate way to use it, in function of its level of maturity, issues faced and business needs. The answers to the questions in this self-assessment do not imply right or wrong practices. They only reflect a familiarity with a body of knowledge about typical kanban practices. The recommended strategy for managing bottlenecks involves a series of steps. Place these steps in the recommended order. Yes. This term is so common in kanban that it is often shown via the acronym WIP. These terms are simply incorrect or not used in the kanban approach. Correct. 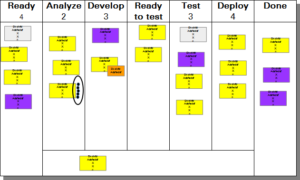 A kanban board implements the kanban practice of making work visible. It is the centerpiece of the daily standup meeting. What is the meaning of the word kanban in Japanese? Signboard (Correct): The term recalls the use of physical signs or cards to manage the flow of work. Fundamentally, what is kanban as a management approach? Although kanban brings many benefits to an organization, it is fundamentally a way of managing the flow of work. When flow is optimized there is certainly an impact on the resources required to do that work and on the quality of the work, but these are effects rather than purposes. Kanban is in many ways diametrically opposed to an approach based on project planning. What term does kanban use to refer to the high level steps performed for doing work? As with all lean management methods, the way in which you work is called the value stream, referring to the steps performed to add value to the inputs, judged from the perspective of the customer. While many would call this a process, the emphasis in a value stream is on the external, customer perspective. The details for performing a single step in the value stream might be documented in work instructions. Otherwise, there is no specific work plan. In the following picture, a number is circled. What does that number represent? The WIP limit for each value stream phase and each swim lane is typically displayed. The count of items in a phase is normally small enough to apprehend the number visually, without maintaining a count. The workload is not generally documented, although individual teams may find it useful to do so. The priority is determined on a work item by work item basis, not on the basis of the value stream phase. On what basis does a team select the next item on which to work? Priority may be determined by several factors, including the class of service and the estimated time required to fulfil the request, with respect to a possible fixed due date. The prioritization is based on transparent and visible policies, not on the desires or whims of the customers or managers. What does it mean when we say that work is pulled? It means that work is not started on an item in a given phase of the value stream until a) the previous phase has been completed; and b) a slot is open in the next phase or resource, such that the WIP limit is respected. It means that work should be started on an item as soon as work in the previous phase of the value stream has been completed. It means that there should never be any buffer queues between two phases of the value stream. It means that any worker on a team has the right to remove work from a queue if that person has the knowledge needed to perform that work. Pulling is distinguished from pushing. In the latter case, it is the fact that the upstream task has been completed that triggers the downstream, independently of the workload, the size of the queue or the limits to work in progress. What is meant by resource liquidity? It refers to the degree to which there is instantaneous availability of appropriate resources when a work item is ready to be pulled. It refers to the polyvalence of team members, allowing them to work on many different types of tasks. It refers to the smooth flow of work through a value stream that has no bottlenecks. It means that the organization has sufficient liquid capital to invest in the resources it requires to do its work. Various factors contribute to resource liquidity, such as the availability of capital and the polyvalence of a team’s members. If resource liquidity is high, then this will contribute to the smooth flow of work and the possible reduction in bottlenecks. But these are causes and effects, not resource liquidity itself. In the picture below, a set of dots are circled. What is the meaning of these dots on a typical kanban board? The number of times defects have been detected and the item has required rework. Suppose a work item typically takes days to complete. 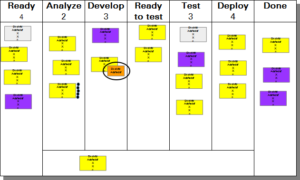 In this case, a team may wish to place a dot next to a kanban card for each day it is in a given phase of the value stream. These dots provide an immediate visual clue to work that may be blocked. Although a team may wish to track the other factors, the dots are traditionally reserved for the time in a phase. In the picture below, one of the cards is circled. What is the purpose of this card on a typical kanban board? The underlying card represents a complicated task that has been split in two. The underlying card has been expedited after work on the item was started. It describes a blockage in the underlying work item. It describes the reasons for cancelling the work item of the underlying card. When a blockage is recognized, a typical technique is to add a brown card to the blocked card and describe thereon the blockage. Some organizations use other colors, such as pink. Other organizations will distinguish types of blockages using different colors. For example, a light blue card might indicate an internally identified defect. The blockage card is removed and saved for further analysis when the blockage ends. Cards can be split when the work is complicated, but it is best to use separate cards in that case. Class of service, such as expedited, is typically shown via card color, not by added cards. When a work item is cancelled, the corresponding card is removed from the kanban board. Which of the following are typical meetings used by the kanban approach? While the daily standup meeting and the (monthly) operations review are typical kanban meetings, scrum is a completely separate approach to work and kanban does not at all use the traditional project management controls, such as steering committees. Which of the following are kanban practices? 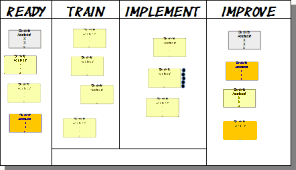 All six major kanban practices are listed. Kanban does not prescribe any specific value streams, so testing is not a specific kanban practice. Kanban does not plan work in advance. It pulls work as it and the resources are ready. Check those of the following statements that are true. 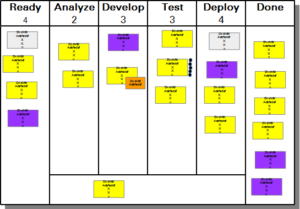 Kanban is indeed part of lean management. However, there is no related ISO standard. While kanban originated in a manufacturing context, it has proven applicable to knowledge work, too. Single piece flow is considered by some to be an optimized goal in manufacturing. However, the degree of variation that characterizes knowledge work makes such an technique extremely unlikely. Who is responsible for replenishing the input queue of a team? Although replenishment is done by the customers of a team, when those customers belong to an external organization the team may need to support the logistics of replenishment. The specific replenishment method used might be documented in an SLA – or not. In any case, organs like a PMO play no role in replenishment, according to kanban. Which is the following columns on a kanban board must have a WIP limit? While most columns on a kanban board do have WIP limits, the exceptions are the Done column (there is no limit to how much work can be completed) and buffer columns, which may, or may not, have WIP limits. Of course, some organizations do have “doing” type columns without WIP limits. While their intention may be to use kanban, no WIP limits means that they are not really pulling work at that point. Although there are many important metrics related to kanban, flow efficiency is an important way of showing how kanban helps to reduce various types of waste, such as the waiting due to context switching. What can you easily see on a cumulative flow diagram? A cumulative flow diagram is a inverted area chart that graphically shows the changes in volumes of ready work, work in progress and completed work for a team over time. The mean volume of work at a given date is seen by the height of the WIP band at that date. The mean duration of work at a given date range is shown by the width of the WIP band. Trends are easily seen in the change in height or width of the WIP band, as well as changes to the volume of ready items. Which of the following are typical classes of service of work items? 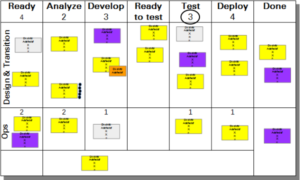 A multiple-choice self-assessment to check you knowledge about kanban.